What are your thoughts on the “OCTOMOM”? Today I have chosen a topic that in some ways is probably superficial. What my thoughts about the Octomom are have no real significance or impact on the world or on their situation but I still have an opinion and since this blog is called: In My Opinion, I thought what the hell! I have to be completely honest. I TRY really hard to see the good in people. I TRY really hard to understand their situation and see where they are coming from and strive to be understanding because I am not in their shoes BUT with this woman named Nadia Suleman I just have great difficulty feeling any remorse or any compassion for her. If you are unaware of who this woman is (how that is possible I don’t know because her picture is constantly splashed on the news or on the tabloids), she is a woman that had six children then decided to get in vitro fertilization (as a single woman). 8 eggs were implanted in her uterus and all 8 eggs attached and she is now the mother of 14 children. I have no problem with a woman or a man raising a child/children on their own but this woman has NO BUSINESS getting in vitro when she already had 6 children and at that time she was struggling to pay the bills. This woman has no affect on my life and what she does is her business, I am strictly stating my opinion because everywhere I seem to turn her face and her sob story are splattered all over. My opinion of this woman is very low because she does not at all convey sincerity. This woman screams to me that she is just looking for attention and her priorities are all sorts of out of wack. 14 children are living under a roof with this woman that to me seems mentally unfit. These children don’t stand a chance for normalcy at all and she keeps defending herself. Below I have inserted a clip of her on the Oprah show and the entire time she is going on and on, I couldn’t help but watch Oprah’s face and how obvious it was that the Octomom was putting on a show. I can’t put my finger on why I feel the way I do….I just feel like her actions never seem to match what she says. She seems to eat her words a lot. She is endangering the welfare of her children by not allowing them to get the individual attention that they each deserve. I read an article the other day and her own mother has washed her hands of the situation. If her own mother does not want to lend a helping hand to raise her grandchildren then there are some serious red flags waving in the wind in my opinion. Her and Kate Gosselin both sit on the top of the list when it comes to unfit mothers. They have both exposed their kids in the media and they have (again in my opinion) have sought fame and recognition and that just sends such a poor message. I write tons of blog entries about children and how important raising them properly is. These two women are so very self-absorbed and want so much attention that they are completely depriving their children of normalcy and the ability to understand the concepts of modesty and sincerity. These children are made to be props in life and I think that is so wrong. If later on in life (when they are able to understand what the media really is) they choose they want that life then that is fine but being exposed to cameras and the public from the time they are newborn babies (by parents choice) is just wrong. I wanted to include some articles and videos just to get some other people’s opinions. Maybe I am being too harsh….I don’t know???? I just can’t shake the feeling that this woman is constantly putting on an act. Does anyone else feel this way? If not, what does she convey to you? The investigation occurred after Suleman’s hairdresser visited her home and subsequently filed a complaint about the conditions Suleman’s 14 children were living in. The hairdresser claimed the famous mom locked her children in a room using a chair and made them use portable toilets outside. She allegedly released photos to TMZ to back up her claims. Suleman, who became known as “Octomom” when she gave birth to octuplets in 2009, defended herself on GMA. “She thought it was unacceptable that they’re half-naked going potty,” Suleman, 36, explained, explaining that the toilet inside was broken. “I mean mom is out there, come on.” As for the claims about the chair, she clarified that one of her older children propped the chair under the door handle to stop the children from entering the room and opening and closing the door. Suleman’s hairdresser also said she paid $520 for a Brazilian Blowout and haircut. “I am making money, though. I have jobs and I can afford it,” Suelman claimed. She also explained that the bill included 14 other haircuts for her children. Following the investigation, the OC Social Services Agency concluded that Suleman’s children were safe and no further action was taken. My last words here are that I truly believe this woman is making one excuse after another. Her house is covered in graffiti. Trust me I understand that her house is going to be far from clean with that many children but there is no reason for the outside and inside of the house to be spray-painted and for the children to be sitting on potties outside (and who knows how full they are and how “clean” they are). She even said that one of the kids propped the chair against the door…really????? I just am unable to feel remorse for this woman. She is playing the role of a victim and there is nothing I cannot stand more than that. She had no business having anymore children and she has made one poor choice after another and the people that are suffering are those innocent children. DISGRACEFUL! This was a train wreck ready to happen from the start … and many of us saw it coming. 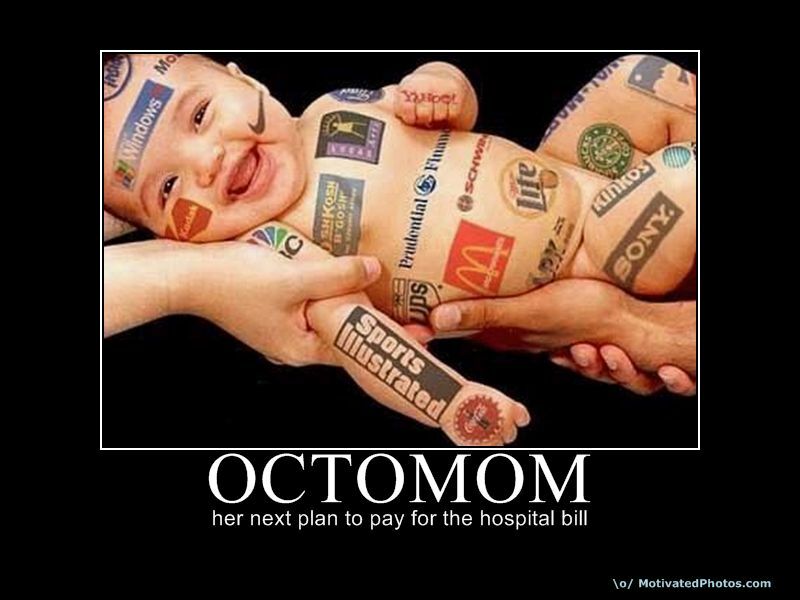 I have no opinion on Octomom because this was the only plausible ending to this story. But I do have an opinion on the doctor who assisted her in becoming pregnant with so many babies. How could a practitioner of medicine assist this single woman with having so many babies? I don’t understand it. It may be her right to have all these babies, but it then turns into her responsibility to care for them. Children are a true blessing from God … and we as parents need to cherish those blessings. That means feeding, clothing, training, nurturing and encouraging them. I am not in her shoes and I cannot understand the need (or frankly, the desire) to have 14 children … and I don’t see the benefit of judging her. But if she has mental or emotional challenges, those challenges should have been dealt with before she became pregnant. It is unfortunate but I think all the doctor cared about was getting paid….like many doctors. Totally agree with you on that aspect, Diane. He should have had his license to practice made null and void. We are of like mind on this subject. Kudos!! I mean don’t even get me started on this lady…I love how yer so nice and are so concerned about offending people. Good post and God Bless ya, don’t worry so much. People like the Octomom have left a wretched scar on my view of humanity, especially in a world where others are struggling mightily just to hold on to friends and family, to get a decent job, and to simply be happy. I cannot support the choices she has made, but the only thing I can think of to do is to live my life differently. You are right on all counts. The part that is so amazing is that in California no one seems to notice that this is cruelty to children. They will leave home with no idea how to be a grownup. As their mother seeks so much attention, her children get none??? I was told to never grab more than I can hold by my parents. Seems like she wants to grab more! It’s a publicity stunt. She’s broke and she still can’t offer individual times with any of her kids. What good could possibly result from this? In my opinion, she needs to give up some kids. I don’t see why social workers don’t just take the kids and put them into a more stable environment. You’re not even supposed to own more than 3 to 4 pets per household in most states. I can only imagine how hard it is to have 14 kids! My dad was a social worker and a lot of times, the kids he took had great results from their new homes. I agree that this OCTOMOM was behaving very irresponsibly! I cannot imagine the ethical standards of such medical professionals that would agree to perform such a procedure!